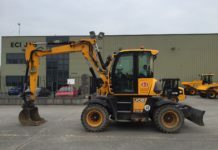 A major step forward in visibility, particularly the three-quarter view to the rear of the machine, has been achieved through a reduction of 235mm (9.5″) in the boom pivot height. Innovative use of materials and components gives a 13% reduction in overall boom section. The result is a 10% increase in all-round visibility, making the machine easier and faster to operate. More compact chassis with 90mm reduction in overhang, combined with new axles with higher lock angles, improves turning radius by 250mm. It all adds up to superb productivity, even on the most restricted sites. Impressive capacity/lift height of 3.5 tonnes/12.3 metres gives superb working lift envelope. 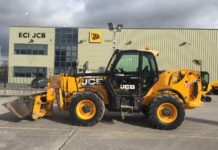 The optional JCB Sway System is available to level the machine when traversing gradients, and a 2750mm wheelbase maintains a stable roading platform. 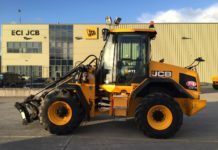 85hp/63kW standard (100hp/74.2kW optional) JCB Dieselmax engine drives through a torque converter, providing smooth take up of power. 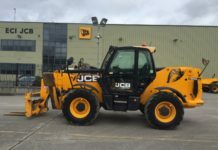 Complete JCB drivetrain, including 4-speed Powershift transmission, boasts proven durability and reliability. 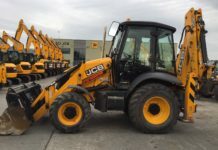 JCB Q-fit lets you change between a huge choice of attachments rapidly. New dashboard and control layout features new, easy-to-read instrumentation that groups all separate analogue dials into a single display unit. At the touch of a button, an LCD display unit lets you see machine hours, time to next service and trip distance. New instrumentation panel incorporates warning lights and has been repositioned so the operator only has to check in one place for machine performance. 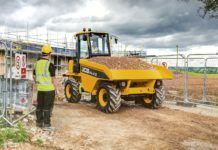 Exceptionally roomy and comfortable with low in-cab noise levels, resulting in a productive working environment. 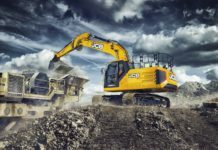 Low-effort ‘Plus’ pattern hydraulic controls ensure easy and comfortable machine operation, and an eye-level load moment indicator provides a progressive readout of forward stability. Integrated boom nose and large boom overlap increase strength and reliability. 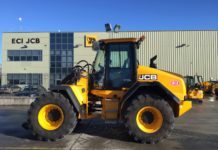 JCB-built key components provide high performance and integrity. Electrophoretically dipping the cab before painting gives long term corrosion protection. Finite element analysis eliminates high stress in components for long-life structures. Manufacturing processes backed by ISO 9000:2000 guarantee consistent quality. 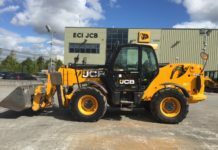 JCB-designed engine and driveline, ease of service and longer service intervals all mean low downtime. Sheer versatility and high utilisation result in maximum on-site performance. State-of-the-art technology and a stylish design command a high residual value. Robust structure reduces site damage. 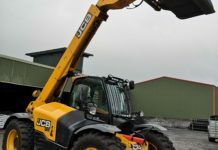 JCB flexible finance options (UK only) are tailored to meet customer needs.